Our logo features the beautiful Himalays, the place where our hearts are and where Tibetan Buddhism has its roots. It symbolizes the union of our passions: The everest that Pramod adores and the Kopan monastery in Kathmandu representing Maaike’s love for Tibetan Buddhism and Nepal. Maaike and Pramod, a Belgian-Nepal couple, want to touch your soul with their spiritual travels. Spiritual means something different for everyone. Maybe you want to find inner peace through meditation and yoga at sacred places and learn more about eons of ancient wisdom. 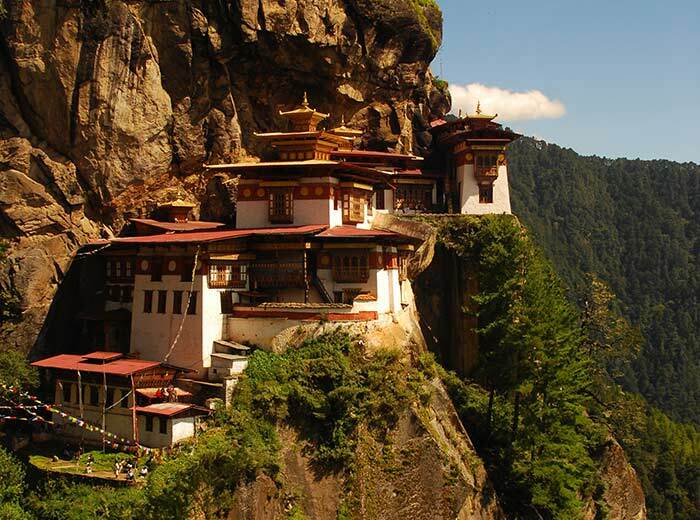 Or do you just want to be wowed by the beauty of the breathtaking Himalayas ? Are you looking to travel with like-minded people? Looking for connection with the heart warming locals? Or are you a foodie and want to learn more about the local cuisine ? Or do you long for action and want to do a trekking, rafting or rather go paragliding? Whatever you are looking for Tara Himalayan Vision will listen and organise the travel of your dream within your budget and interests. 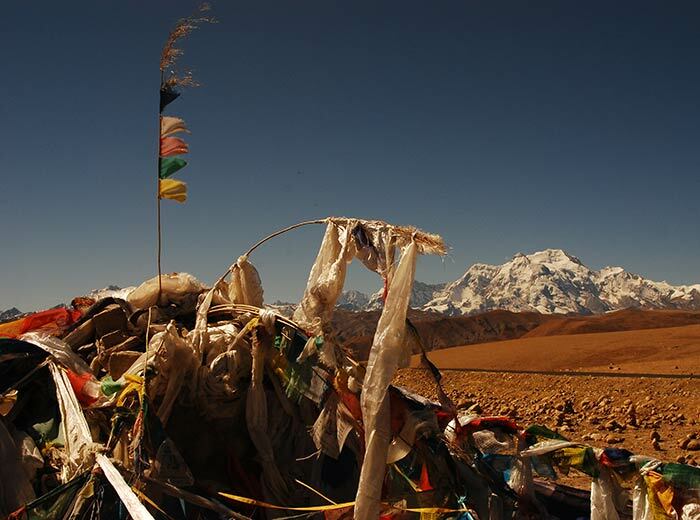 Since her childhood Maaike has been attracted to Asia, Buddhism and Tibetan Buddhism in particular. Her favourite parts of the world are Tibet, Ladakh, Nepal and Bhutan. In 2010 she met her teacher Tulku Lobsang Rinpoche, an internationally very highly respected Buddhist Master. Today they work closely together. 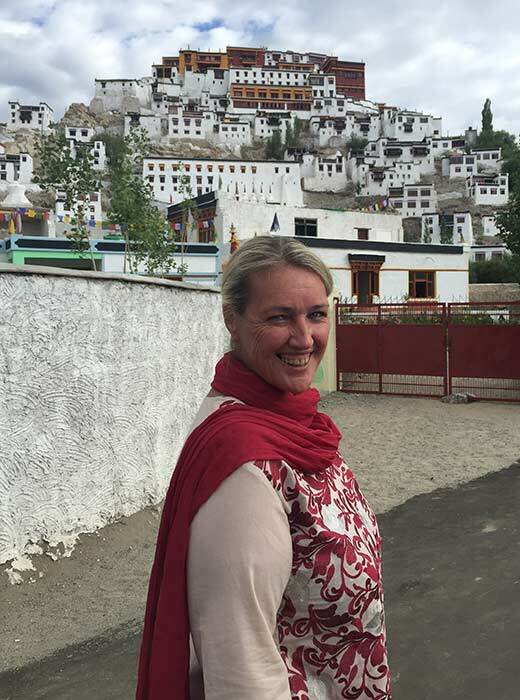 Maaike has learnt about Eastern philosophy, studied Buddhism and integrated yoga, mindfulness, meditation, breathing techniques and Tibetan medicine into her Stress Release Program. Her roots lies in the business world. For more than 13 years she worked as a manager in major companies. She understand the importance of performance and the pressure to perform well. Today she combines ancient Eastern wisdom with Western influences in her educations and business programs, which makes her a unique teacher. Since 2012, she organises trips to France, India, Tibet and Nepal to bring people closer to themselves. Maaike leads Tarayogini , where she trains yoga teachers on behalf of Tulku Lobsang. Her mantra is: ‘ We can not change others nor circumstances. We only have an impact on ourselves and how we stand in any given situation.’ From this philosophy she coaches people to help them transform their way of thinking, using various physical and mental exercises that have their origins in a very ancient wisdom. Maaike has more than 10 years of middle management experience in the stressful environment of corporate international organisations. She has personally been confronted with stress and burnout. She has learnt about Eastern philosophy, studied Buddhism and integrated yoga, mindfulness, meditation, breathing techniques and Tibetan medicine into her Stress Release Program. She manages to combine old Eastern techniques with Western influences, which makes her a unique teacher. Since 2012, she organises yoga and meditation courses in France, India, Tibet and Nepal to bring people closer to themselves. 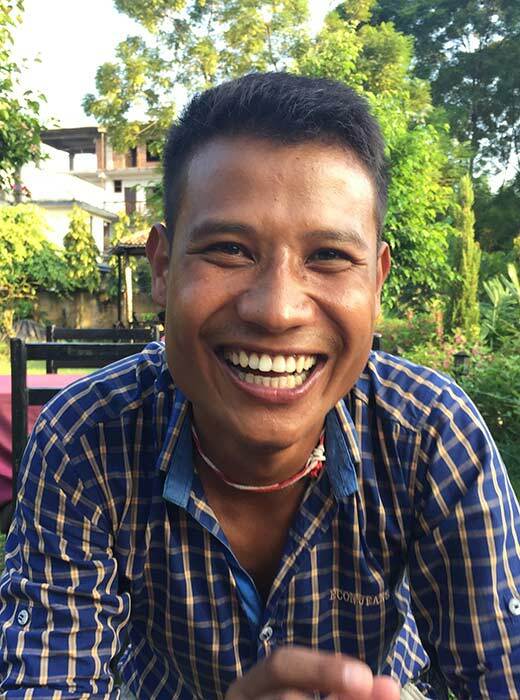 Pramod was born an raised in Kavrepalanchok, a Nepalese village close to the Tibetan border. Tamang is the name of his tribe and indicates he has roots in Tibet and comes from horse riders. In Nepal you have about 90 different tribes, each with their own language. Pramod can tell you everything about it. The Nepalese culture and lifestyle have no secrets for him. Do you have a question about Nepalese politics, local living conditions, the story of the snow mountains, Nepalese cooking or the fauna and flora? Just ask him and he will tell you everything you want to know. He has more than 9 years of experience in the tourist sector and knows every spot in Nepal. He has guided treks all over Nepal, from the eastern to the western part of the country and up to 6,500 meters. He is passioned about the story of the snow mountains and he knows the importance of a good preparation to make your trek an enjoyable experience. He will inform you how you can prepare your trek before leaving your home. Pramod has more than 9 years of experience in the tourist sector, more specifically in trekking. He has guided treks all over Nepal, from the eastern to the western part of the country and up to 6,500 meters.  All guided tours and business travel are accompanied by Pramod and Maaike. Custom travel will guided by Pramod and Maaike upon availability, or will be provided by local people we know very well and trust. All activities like mountain biking in the Himalayas, paragliding, canoeing, rafting, trekking, etc are guided by experienced professionals. In all the other Asian countries, Ladakh, India, Bhutan and Tibet, we work toghether with local people we already know for years. People who have the same values as us. On the most trips we offer we will also be there to guide you. For our custom travels we work together with Sameer. I met Sameer in 2012 when I was on a pilgrimage travel in India. I remember the long talks we had on our travel about the culture in India. Sameer is the manager of an established travel agency in India, that exist for more then 10 years. Since 2012 I organised all my pursonal travels through Sameer and also many travels for customers. Sameer and his team have a good knowledge about travelling all around India. 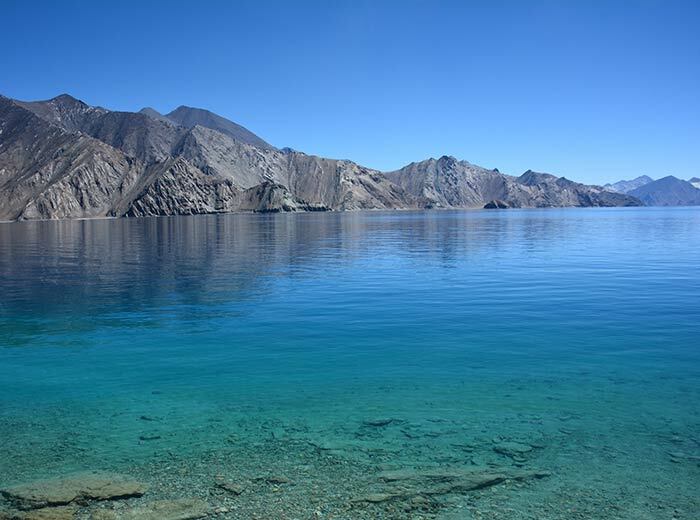 Our organized tours are in the North of India, in Ladakh, or little Tibet. There we work toghether with Punchok Spalzang. I met Phunchok in 2014 when I was there for a course with HH Dalai Lama.Phunchok is a ladakhi, what means a local citizen. He has his own travelagency since 2013. We have been working toghether for groups in 2015 and 2016. I met Tshering Yangzom through Tulku Lobsang Rinpoche, my master from whom I learned all my practices. She has toghether with her sister a travel agency in Bhutan. In 2016 I went on a pilgrimage to Bhutan and worked very close toghether with her. We discovered we have the same goal – showing the people the authenticity of the Bhuddist culture. Togheter with her, we work out the travel of your dreams. We want to touch your soul during the travel of your dreams. We find it important to deliver impeccable services and we do that by operating out of our 5 core values. Our travels are tailored to ensure you savor the essence of the real Nepal. We will bring you in contact with the local people, let you experience the greatness of its nature, let you explore authentic Buddhist techniques or bring you in contact with the old traditional culture. We want deliver you memories that will last a lifetime. 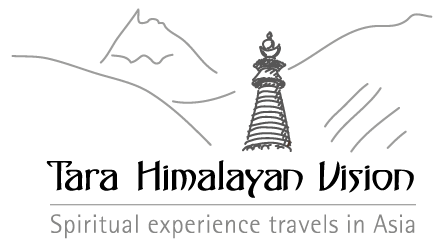 Tara Himalayan Vision is committed to give you a journey you will never forget.  Tara Himalayan Vision also stands for tourism with respect for it surroundings and culture. We contribute to the development of the local community through our project “ a Warm Heart for Nepal”. Tara Himalayan Vision listens to your needs and will create a journey that respects your interests and believes. We offer travels with respect to the natural environment. Nepal is a beautiful country and we want to keep it this way for generations to come. We respect the local culture and its people, and we are inclusive to all religions. We commit us to make all our promises to our clients true. But we also commit ourselves for rebuilding the country through our project ‘a warm heart for Nepal’, 5% of our benefit is the minimum we donate ourselves to the project. We have the passion to touch your soul and bring you on an inner journey in the beauty of the Himalayas. We love to work with people and bring them closer to themselves while enjoying the time of their life. Our Heart is in Nepal and we dream to bring many people in contact with this beautiful country and its heart-warming people.